Yesterday, we ventured into Portland despite the threat of a big windstorm. We were craving a quintessential Portland Saturday, which meant we had to start out the day waiting in line more than an hour for brunch. On purpose. Because that’s what goes down in the Rose City on weekends. Portlandia devoted an entire episode to this uniquely PDX phenomenon, and hit the nail squarely on the head. Those lines are not an exaggeration. The weird thing is, we know about them in advance – but it doesn’t stop us from putting our name on a list and happily giving up 60 or more minutes of our hard-earned weekend to standing around in the brisk, cool morning air, fully exposed to the elements. It doesn’t matter where you go, either – there’s going to be a line, and it will be a long wait. But we happily queue up, and are thankful for the experience. God, we’re a weird bunch. We settled on the Tin Shed on Alberta Street, which is – true to its name – nothing more than a repurposed tin shed, right down to the windows covered in plastic sheeting. The crowd spilled out onto the sidewalk, a mass of flannel and plaid and North Face vests and beanies and one ill-advised pork pie hat worn by a guy we decided was trying too damn hard to pull off a subversive look that was comical more than anything else. The Tin Shed wins extra Portland Points because it’s dog-friendly. By that, I don’t mean you can tie your dog up outside while you enjoy breakfast. Fido is welcome to eat alongside you at your table. Sure enough, once we finally got seated, roughly every third table had a canine dining companion. Most of the dogs were dressed in scarves or sweaters, because it was a chilly morning. And also, we were eating in a repurposed tin shed with windows covered in plastic sheeting. I gotta say, the dogs were pretty well behaved. Can’t say the same for the screeching toddler in the corner. The food was delicious, and the Bloody Marys with house-infused cucumber vodka definitely hit the spot. After brunch we drove to Powell’s Books, probably my favorite place in town. For the uninitiated, it’s a bookstore the size of a city block. Literally. We hadn’t been there in far too long, so we settled in and, Kindles aside, ended up with a handful of paperbacks apiece. 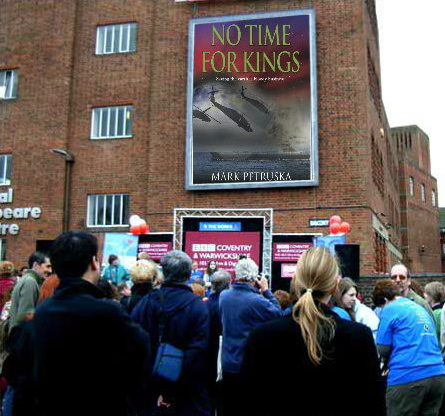 There was an author there doing a book signing, and when Tara commented on the cheers and applause she had heard, I tried to convince her it was a spontaneous outburst by the crowd when they realized the author of No Time For Kings was in their midst, but she didn’t buy it for a second. A fella can dream, though. We topped the day off with a trip to Music Millennium for a couple of records and DVDs. Our outing ended a little sooner than we’d planned, but by then the wind was really gusting, and a cozy late afternoon and evening back home sounded pretty appealing. Fortunately, none of the 100′ tall fir trees outside our apartment toppled over, though others around town weren’t so lucky. Ha! I love marionberry everything, but this place doesn’t have pancakes on the menu. Instead, they’ve got fresh scratch-made buttermilk biscuits (best in town) which I enjoyed with raspberry jam. Not a bad substitute! That sounds like a grand day……food, books, records! My daughter and her now-husband go to a hipster breakfast place that makes incredible french toast combinations, etc. I’ll have to ask her how long the wait is. Portlanders must be patient people though. I can’t imagine standing outside in a line to eat. They would probably enjoy the “house-baked sweet potato-cinnamon french toast, dusted with powdered sugar and served with fruit compote and pure maple syrup.” Didn’t get it myself, but it sure sounds amazing, huh? Mark, I LOVE the video clip!!!!!!!!!!!!!! Brilliant piece of photo editing. BRAVA! Sounds like you and Tara had a super weekend. Mine was great too because I actually had off this weekend, which is sooooooo rare for me. So I took a day trip outside of the city today and had the best time ever. You would totally fit in and love it here, Ron. Trust me! I miss Powell’s. And you SHOULD do a book signing there. And hand out voodoo donuts with your book. Mmmm…reading and donuts. Seeing that Voodoo Doughnut makes an appearance in my novel, that’s more appropriate than you think. I love your idea! Now this sounds like my kind of weekend! I love relaxing but still getting to explore a bit. Sadly my weekend was rather boring this time around, I worked on Sat- caught up on my tv shows when I got home and then rinse and repeat on Sunday. Nothing to write home about. In this day and age, catching up on TV shows takes real effort. I’d call that a productive weekend! I love the weirdness of Portland, and how much we take pride in our weirdness! I never made it to the Tin Shed, but I will absolutely have to check it out when I return to the Rose City. 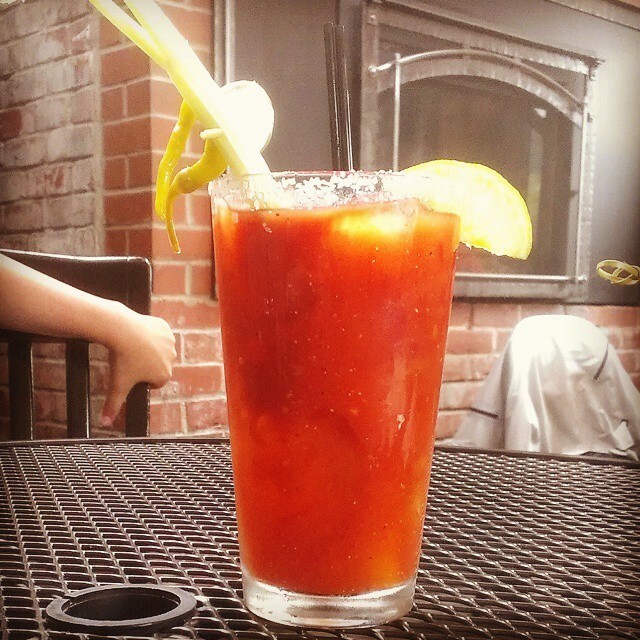 The Bloody Mary, alongside adorable pups dressed in winter clothes… I miss it so! Sounds like the perfect Portlandia morning.